Complete your wedding dress with the perfect wedding necklace. Whether you’re looking for a single pearl pendant, modern pearl or statement pearl and crystal wedding necklace. If you can't find your bridal necklace, we'll create it for you. Bridal Necklaces There are 57 products. The ultimate piece of bridal jewellery for traditional church ceremonies, the Abbess Pearl and Cross Wedding Necklace in Bridal White will make a standout addition to any bridal gown. A modern twist on the classic pearl choker, the Adriana White Pearl Wedding Choker Necklace is beautifully embellished with moonstone and genuine Swarovski crystals. 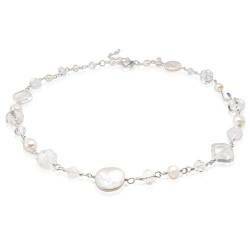 The Ariel Pearl and Quartz Wedding Necklace is a beautiful piece of jewellery for brides who adore the inimitable shimmer of freshwater pearls and the subtle sparkle of rock crystal. If you are looking for a truly unique bridal necklace with contemporary charm, the Artemis Triple Silver Disc Pearl Wedding Necklace could be it. Chic, stylish, and beautiful. The Assorted White Pearl Wedding Necklace combines modern elements with antique allure. Length adjustable to complement all wedding gown styles, it is a stunning piece of jewellery for modern brides. 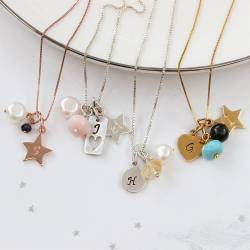 A brand-new addition to our exclusive bridal collection, the Birthstone Gemstone Wedding Necklace can be personalised for each member of your bridal party. The perfect gift for brides and bridesmaids. Dainty, delicate, and designed to delight, the Bridal Pearl and Crystal Necklace will lend just a hint of subtle sparkle and sophisticated shimmer to your wedding day look. If you are looking for a minimalistic masterpiece to complete your wedding day ensemble, look no further than the Cassio Swarovski Pearl and Crystal Wedding Necklace. The Corin Flower White Pearl and Leather Bridal Necklace was made for boho chic wedding gowns and romantic beachside creations. A floral fantasy for feminine brides who want to make a statement. 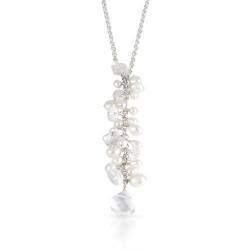 Make a statement on your wedding day with the Crystal and White Pearl Dangle Wedding Necklace. A shimmering sensation of freshwater pearls and rock crystal, it is the epitome of bridal glamour. The Crystal Teardrop and Pearl Wedding Pendant is a stunning Bridal Necklace with natural crystal quartz and bridal white freshwater pearls. A lovely keepsake, it complements all colour schemes. 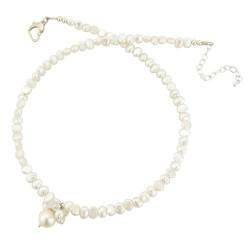 Understated and beautiful, the Dewdrop White Pearl Wedding Necklace will bring a touch of romance to your wedding day. Chic and sophisticated, it pairs effortlessly with all bridal attire. What could be more romantic than this Entwined Double Heart Wedding Necklace. A symbol of commitment and everlasting love, it is the perfect wedding day gift for glamorous brides. Personalised bridesmaid gifts are one of this years biggest wedding trends, and with this Faceted Crystal Heart Wedding Pendant, you can create a customised gift for every member of your bridal party. Understated elegance for sophisticated brides, this Faceted Crystal Teardrop Wedding Pendant Necklace will lend just a hint of subtle sparkle to your wedding day ensemble. A lucky charm for lucky brides, this Faceted Crystal Wedding Pendant Necklace with Horseshoe Charm would make a stunning wedding keepsake gift for brides, bridesmaids and flower girls. 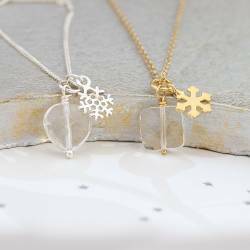 If you are looking for a stunning piece of bridal jewellery for a winter wedding, this Faceted Crystal Wedding Pendant Necklace with Snowflake Charm could be it. Shine like a star on your wedding day with this Faceted Crystal Wedding Pendant Necklace with Silver Star Charm. 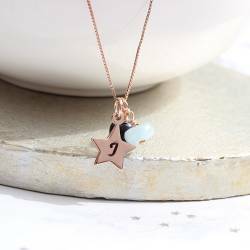 A stunning keepsake for bridesmaids, it can be personalised with any initial. Offered in Sterling Silver or Rose Gold, the Floating Heart Wedding Necklace will add the finishing touch to your bridal ensemble. Simple yet beautiful, it is the perfect wedding day gift. An eye-catching piece of bridal jewellery, the Harlequin Glass Heart Wedding Pendant Necklace is available in three delightful colour options to complement every wedding colour scheme. 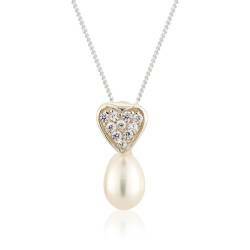 If you adore the inimitable lustre of freshwater pearls, this Heart Pearl Wedding Pendant Necklace could be the perfect choice for you wedding day. Chic and sophisticated, it oozes natural charm. The Helena Crystal Wedding Necklace guarantees to make you sparkle on your wedding day. Embellished with natural quartz and freshwater pearls, it is a stunning piece of bridal jewellery. Diamond and pearls may be a girls’ best friend, but if you are looking for a more affordable option for your bridal party, the Imogen Swarovski Pearl and Crystal Wedding Necklace could be it. A contemporary twist on the classic pearl wedding necklace, the Keimau Bridal Crystal and Pearl Necklace combines modern elements with timeless appeal. 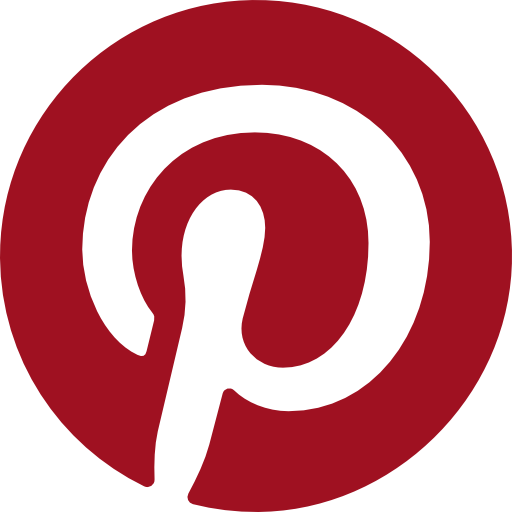 Perfect for strapless wedding gowns. Timeless, romantic, and oh-so pretty, the Keimau Pave Crystal Star Wedding Necklace is a magical piece of jewellery for brides, bridesmaids and flower girls. The perfect wedding day gift.